So this week’s theme has been Spring Break vacation. So I thought I would break up the posts about the traveling and show you something I made for the trip. Recently, I returned to college to get my teaching degree. I won’t get into all of it but as part of the supplies I needed, I got myself a desktop tablet. What is a desktop tablet you say? Well, it is a Windows tablet that is about 20″ x 19″ (big) but runs everything my husband’s regular desktop does except for having a cd drive which is no big deal to me. Anyway, I wasn’t able to buy a case for it for two reasons. 1. I’m cheap and don’t want to spend the upwards of $4o for a case which pretty much is just a laptop case to carry it & all the accessories. 2. I didn’t anything I saw even if I did want to spend the money. But I had to have a solution since I had to take all my school related work with me including my tablet. All my classes are online so leaving it wasn’t an option. So what was I to do? Make something of course. Just a bit of a warning here. I didn’t a pattern to follow even though I looked online and saw a few projects I liked. It wouldn’t have done any good for me to buy a pattern or spend the ink to print instructions. I’ve never been able to follow a pattern and get it all right. I improvise or forget steps or I don’t cut or sew straight (which is usually my problem in everything crafty). I hope the pictures and my instructions will be helpful. So first things first. I didn’t run out and buy any fabric as I have a decent stash in my closet just waiting to be made into something somewhat fabulous. I chose two different fabrics, a dark color for the outside and a lighter color for the inside. The overall theme is pink though. Step 1: Measure the tablet or whatever you are going to use it with. Write this down where you can easily find it as needed. Also, it would hurt to make a small drawing to go with it showing which is the long side and which is the short. Trust me, it will help when it comes to cutting and assembling. I have no photos for this step. Step 2: Get all your tools and fabric ready. 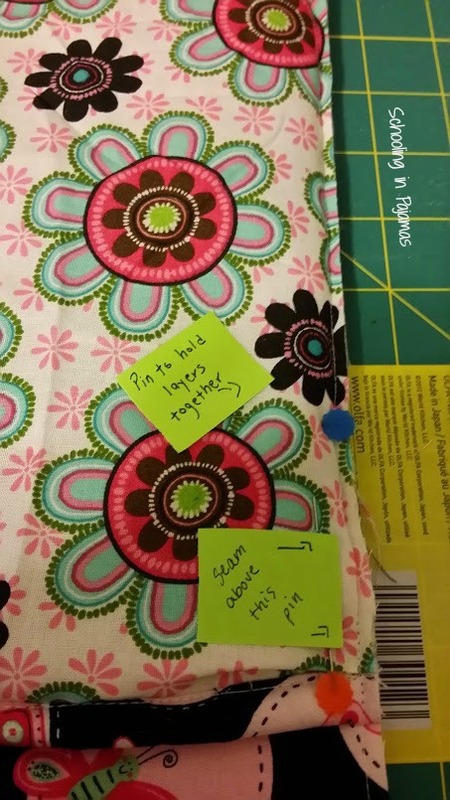 Tools I used included a metal ruler, rotary cutter, self-healing cutting mat, fabric pencil that erases, scissors, fabric, sticky note pad, and batting. You will also want to have your machine threaded with your preferred color before hand. This makes it easy to grab and sew as you have time. 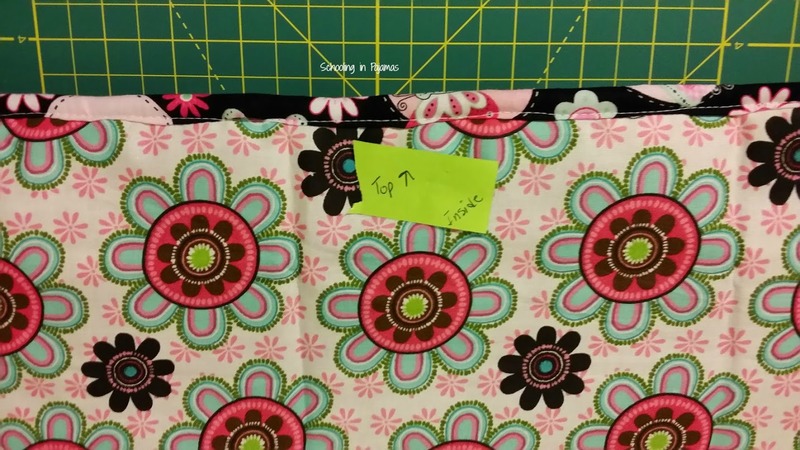 Step 3: Mark your fabric with your measurements onto the wrong side of the fabric. Place individually on the mat and use the rotary cutter to cut the pieces. Tip: Use the metal ruler after you mark your fabric to keep the rotary cutter on the correct alignment, no sideways cutting. Metal rulers are preferred. If you use a plastic ruler, you may see pieces of it shaving off as the rotary cutter goes along its edge. Step 4: This is the step you will use the sticky notes for. I had sticky tape that comes on a role and is found with the Post-It notes. Before moving on, you will want to place Post-Its labeled with top outside and an arrow or top inside and an arrow. This will help as you place all the layers together and as you sew everything together. It is easy to get confused and make a wrong step. Here is a photo for you to see. Both pictures are after I sewed the layers together since I forgot to take earlier pictures. But you get the idea- label, label, label! 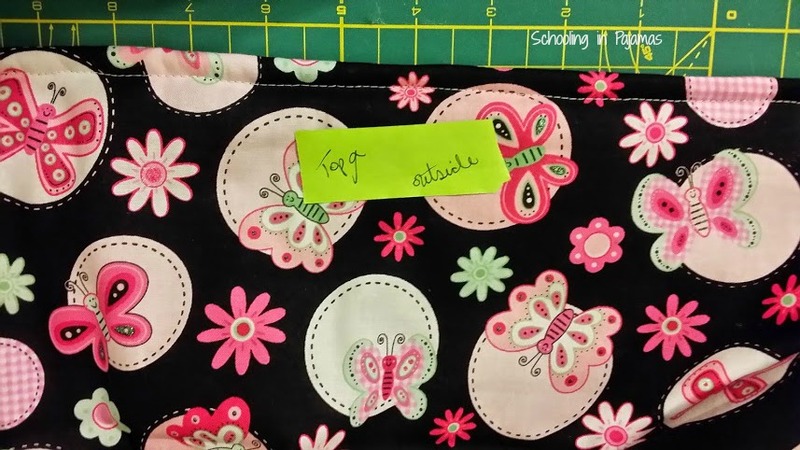 Step 5: Once you have labeled and aligned your material, you will want to pin them together. Make sure you put the two outside pieces together. You will be turning it right side out so this is a crucial step. Again the labels are very helpful for this. 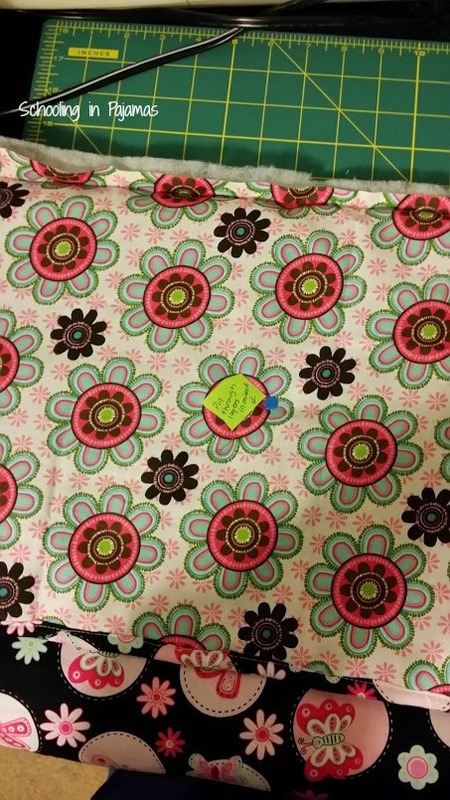 I would recommend you use quilting straight pins as they are longer and will keep the fabric from puckering as you pin together. 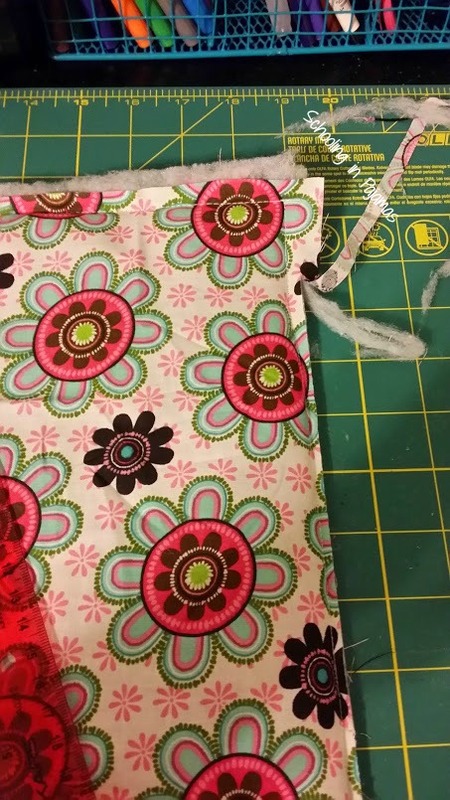 I was always taught to place the pins sideways however if you are using the quilting straight pins you do not need to do that with this step. My pins have a hard plastic flower on the end which makes pushing and pulling that much easier. You can see the blue flower next to the green sticky tape. That is the top of my quilting straight pin. Step 6: Before moving on, place two more pins toward the middle of the fabric closer to two edges. I would suggest the two longer sides. This will keep it stable while moving the fabric around on the machine. Before sewing the sides together, you will want to take the edge that will be on its own & sew it together. Cut the thread and then proceed to sew the other sides together. MAKE SURE YOU DID NOT SEW YOUR OPENING SHUT. Sorry for the caps but you will be extremely frustrated if this happens. 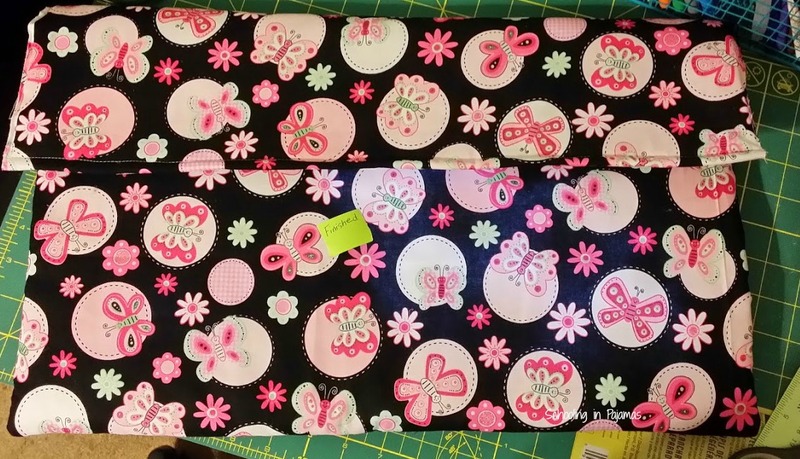 Here is pic showing the pin for the seam allowance and what it will look like after sewing the seams. Step 7: Before turning the bag right side out, you will want to cut off the excess material to make a closer edge. Remember the tip I gave about using the metal ruler? Well, it was from experience. As you can see I began using the plastic ruler first but I learned from my mistake and searched out my metal ruler. Step 8: We’re almost finished. Hang on just bit longer! Now turn the bag right side out pushing the corners with your finger or the end of a pencil (the eraser side). Check that all pieces of the fabric were caught with the seam. I had one small section that was barely out, so I turned it back inside out and just ran it through the machine on that section. Once you are satisfied with how it looks, you are done! I chose not put Velcro or another closure on it. Instead, I place the tablet in the bag then tuck the top inside. In hind sight, I wish I had made it about 1/2″ less in overall size. It was a bit lose but otherwise it was good. I also may go back and add in some type of closure because it did not stay tucked in as much as I liked. I think I will also work on something for the wireless keyboard and mouse. The tablet was too big for any of my bags and backpacks so I am gonna save up for some type of bag. 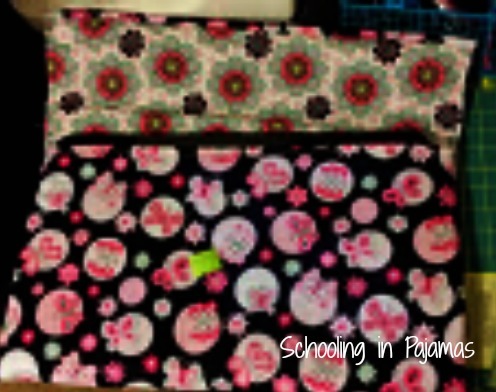 Hobby Lobby and Wal-Mart both sell a quilted travel bag that I might get and put it all in on top of any books I might carry. Overall, I am pleased with it. It worked great on the trip but I would have preferred a strap to carry it. It looks good and kept it clean and free from scratches. Leave a comment and let me know what you think or share a project you have made. Tips are always welcome as I am a very beginner sewer in my skill set. Thanks for visiting!